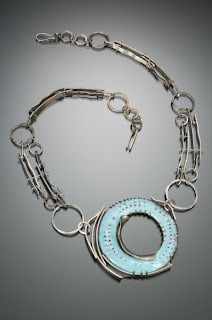 For years, I've aspired to attend the American Craft Council Show in Baltimore, where 800 booths showcase the best of the best of American handmade: jewelry, wearables, ceramics, baskets, wood, stone and metal. Finally, I turned around four days after my return from Philadelphia and made my way back east to meet up with friends and peruse the show for a few days. Not only was it exhilarating to catch up with good friends, but the inspiration from the incredible work displayed at the show was just what I needed. I have characterized the experience as "living in my Pinterest boards," because I saw so many actual pieces that I have pinned to my inspiration boards. My head has been totally awhirl after my return from these two weeks of input, but I've tried to distill down some of my most favorite. 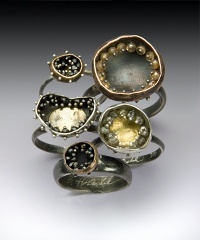 Carolyn Morris Bach is one of my all time favorite jewelry makers. I love the combination of whimsy and finesse in her work. Her booth display is about as close to a gallery presentation as possible: white hard walls and white shadowboxes with white silk linings hung on the walls. Clean and spare, with the focus entirely on the spotlit jewelry. It was a treat to see the hand-carved details of these tiny stone foxes and birds. 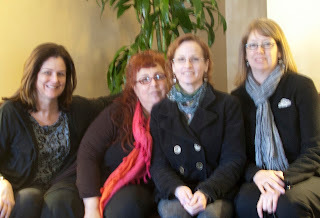 Linda Kindler Priest was a treasure to speak with in person. I've long admired her amazing gold reliefs matched with stunning stones. I learned that she does her own lapidary work so that she can perfectly suit the stone to the metal work. I admitted that I have even more respect for her work after my own foray into chasing and repousse. If I need to follow that lead further, Linda also teaches. 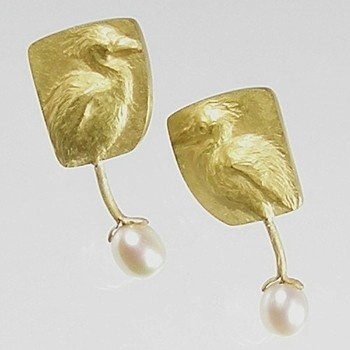 I think I just pinned these bird earrings the week before I saw them in person. 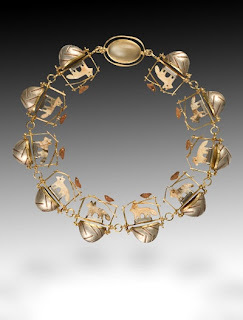 I loved chatting with Brandon Holschuh about his incredible jewelry, the integral displays that he constructs for every piece, his new book coming out soon, and his classes. Susan Chin's gorgeous ebony and bone jewelry was one of my favorites. 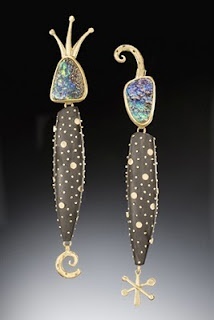 These very earrings, or a pair quite similar were front and center in her glass case. Wendy McAllister had a stunning display as well, again with each piece wall mounted with lots of space to show it off at its best. This enameled brooch, or one very similar, caught my eye from across the aisle. 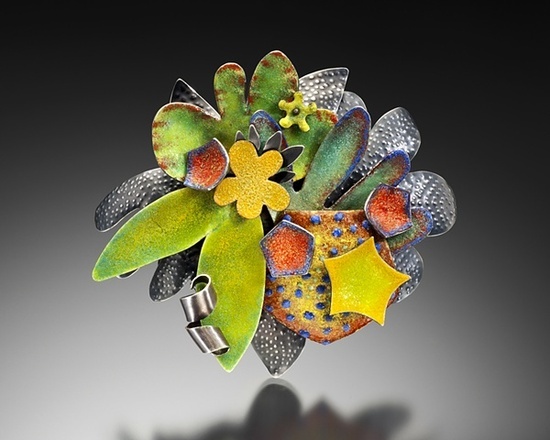 Beth Novak had a collection of her enameled jewelry on display. It's exciting to see all the details and linkages in her intricate work. I could go on and on this way, but then I'd be doing nothing with all that inspiration that I've gained. Someday I'd like to exhibit at this show amongst these incredible artists. Oh my goodness- lucky lady! I would've been in eye candy overload. Exactly! I was totally overwhelmed at seeing so many of my idols there!